I'm sure by now you all know where I find most of my recipes and this one is no different. Browsing Kraft Food and saw this one and it looked and sounded pretty good so it is today's Tasty Tuesday. -COOK spaghetti in large saucepan as directed on package, adding stir-fry vegetables to the boiling water for the last 3 min. -MEANWHILE, heat oil in large nonstick skillet on medium-high heat. Add chicken; cook 6 min., stirring occasionally. Stir in tomatoes and dressing; bring to boil. Simmer on medium heat 4 min., stirring occasionally. Add cream cheese spread; cook and stir until cream cheese is completely melted and mixture is well blended. -DRAIN spaghetti mixture; place in large bowl. Add chicken mixture; toss to coat. Sprinkle with Parmesan. 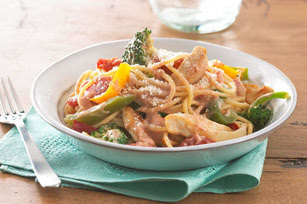 Substitute: Substitute your favorite frozen vegetables for the stir-fry vegetables. Or, use cut-up fresh vegetables; just add to the cooking water for the last 4 min. of the spaghetti cooking time.